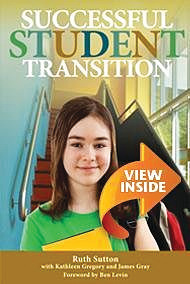 This book deals with the shift from elementary to secondary schooling (what a colleague of mine once called “big little kids becoming little big kids.”) The author primarily draws on experience and research from England, Australia, New Zealand and Canada where the transition occurs at varying times (often secondary schooling starts in grade nine, but in some jurisdictions it is grade 7 or 8 or even 10). Sutton’s concern is, whatever stage the gap takes place, the shift generally involves students abandoning the comfortable confines of an elementary “providing” school for a much larger and more distant secondary “receiving” school. Typically this means students leaving their old classroom teachers, who have taught pretty much everything to them and have gotten to know them over the course of an entire year, for a new institution where subject specialists—responsible for maybe 100 students or more a semester—see them only briefly each day or two as the students continuously rotate from classroom to classroom. While most eventually muddle through this articulation, research suggests as many as 40% fail to make significant learning progress in the year after the shift has occurred. Traditions, financial demands and logistical considerations will probably keep this gap in existence so Sutton proposes a variety of practical “bridges” designed to “reduce the number of learning blocks” students inevitably face at transition. Principals on either side of the divide can meet to coordinate visits and shared activities; providing and receiving teachers can compare curriculum expectations and become familiar with each others’ classrooms; and students can bring along a portfolio of work so all parties have some concrete idea of the past record of achievement. Essentially the book advocates positive relationships, open communication and sound assessment strategies. This professional resource would be a valuable work for board officials, school administrators, participants in professional learning programs on both sides of the divide, as well as students at faculties of education or in principal-training courses.